I am finally running a sale! There are some great deals here, just in time for spring and short sleeves! This gorgeous triple wrap features shimmering 4mm round Pietersite stone beads. Also known as eagle’s eye, this rare variation of tiger’s eye contains shades of rich browns, coppery reds, cream and a surprising gray/blue. The stones are wrapped in 1.8mm bronze metallic leather with an antiqued gold button closure. Fits petite to medium wrist when wrapped 3 times. 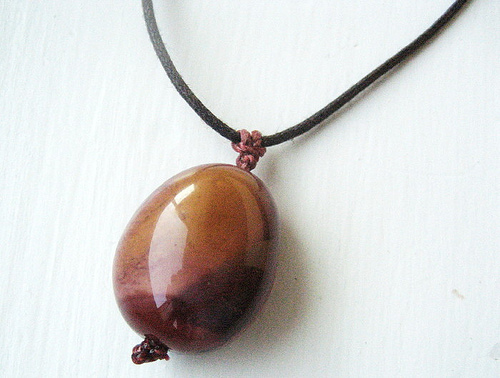 This adjustable pendant features a gorgeous, large Mookaite jasper nugget in a deep goldenrod color with dark brown markings. This earthy design is finished off with dark brown metallic and cream glass beads. The stones are attached to 1mm dark brown, waxed cotton cord with dark brown S-Lon thread and two adjustable sliding knots allow the wearer to choose up to an 18” length (36″ cord) when fully extended. So, stop on by and look around, you just might find a great bargain! Check back often for new items, too!